It doesn't matter how fast you're going, just that you're going in the right direction. Join me at my new blog ... http://debbieroser.wordpress.com/. links in the left frame of this site. Yesterday evening we got the first James Bond movie out. We watched The Living Daylights, featuring Timothy Dalton. By the time we get to Lisbon, we might get through every Bond flick made, except the last two. We have all others, twenty, on board. The weather has been fine. Not great, but not rough. Too hot from noon until the Sun goes down. We went back to motorsailing yesterday evening, and are on the verge of launching the asymmetrical spinnaker to get back to just sailing again. The issue, we see a new low thirty miles in front of us with winds over 20 knots. We are now in true winds in the high teens. Maybe a bit too fresh for the spinnaker. For sure too fresh if the wind strengthens? We are not tentative sailors. We just don't court excitement over comfort and safety. As for marine life, John found a flying fish in the galley this morning! How do those things get so high off the water? And how do they rifle through one of the few possible small openings? In early morning watch stupor, Barry thought the thing was just a fishing lure John was showing him. We hear they are good to eat, but nobody wanted to test the rumor. If we failed to mention the pilot whales, we came upon a pod of them yesterday or the day before. We are over half way to Bermuda. It looks good for a Saturday evening arrival, but that could change in a minute. We have settled in to the voyage. Watches are going smoothly and changing nicely. Most of the last day was comfortable motorsailing. Right now it is slightly uncomfortable motoring. There is just no wind. Swells are six feet or less, but the boat is still rolling to and fro. There has been some, but not much, excitement. As for marine life, we saw tens of manatees while still in the Banana River and Canaveral Canal. We saw a huge brown ray while still close to the beach. We regularly see flying fish. As for traffic, in addition to seeing a few vessels mostly miles off, we saw a Navy vessel and were chased south a ways because of "operations that might be hazardous to our vessel." We should have wondered what operations. We learned later. Several hours after the Navy ship redirected us, a flash brightened the western sky, a great round white light rose into the sky, disappeared behind clouds, came out the top of the clouds, and continued directly overhead, racing off toward space! It was a spectacular rocket launch, punctuated by two sonic booms minutes after the rocket was gone. The worst thing, most of the oranges have already rotted. Finally at 14:00 we are in the Atlantic. Seas are 1 to 2 feet. Wind is 7 knots at 120 Magnetic. We will be motorsailing when we get around the Cape and set up for Bermuda. Right now we are making 6.8 knots SOG. We departed Telemar Marina at 08:10 and headed north for Port Canaveral. We bent the wind indicator and the lightning arrestor on the first bridge. We scraped the VHF antenna on the first, second and third bridge. We are good to go since wind sensor and VHF operate well, but thankfully there are no more fixed bridges to deal with, just two opening bridges and one lock. substantially deteriorated. We would not be departing soon. ride home. Yes, we may end up far enough north that it will be cold. freshen up. We will again when in the Azores. Hopefully we slip lines tomorrow at first light! I am bored waiting. something we aren't expecting we will be off. Sunday morning about 08:00 am. Captain says we go Monday! take for the big weather we are experiencing to dissipate? It will interesting to see whether the forecasters were accurate. While we don't have the professionals' reports yet, we are delayed. Wednesday. Thursday is a slight possibility. Friday looks best. friends, will just be a hoot! Atlantic crossing on the list of personal pursuits, accomplished. Some of you have been following this blog or otherwise already know the latest about our journey on Charmed. I wanted to recap what a wonderful year it has been so far and where we are. After the holidays last year, we departed Daytona Beach on January 1 and headed south to wait for a weather window to make the run to the Bahamas. 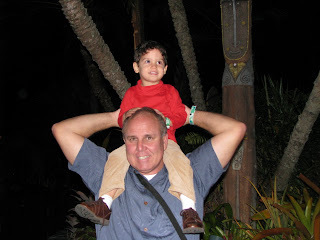 This was basically to be our first trip to the Bahamas ... the first trip taking Charmed out of the country. We got to Miami Beach as quickly as we could, made arrangements through the Coast Guard to make our return back to the United States smooth and easy (which, believe it or not, it really was), watched the weather and then headed to a place called No Name Harbor, which is in the southern part of Key Biscayne, to get into our jumping-off position. In the meantime we had met up with our friends, Jenny and Charlie on Lady (http://www.AboardLady.com/), so we could travel together. At No Name, we also caught up with more friends on two other boats, Eva and Ed on Makai and Sarah and Phil on Spartina. All four of us left on January 11 at 3 a.m. and had a perfect ride over. We were lucky to get and take that weather window. We heard of others waiting for more than 20 days in No Name Harbor for the next weather window and finally giving up and never making it to the Bahamas. This wouldn't be complete without a word about living on a boat. We feel Charmed is very comfortable and we had everything on board that we needed and wanted, and with room to spare so we never felt crowded. We knew grocery shopping was going to be an issue, not only because some places were so remote that getting groceries and/or getting the groceries we wanted would be difficult, but also because the cost would be high. Both turned out to be true, but we were prepared. We had not only provisioned well, but we had over-provisioned (we STILL have food left over). In American dollars, we spent only about $130 for additional groceries in the more than two months we were there. When you consider that Bahamian prices are at least twice as high as U.S. prices (realizing we actually spent and extra $260), we were glad to have provisioned so well. The second potential issue for us was water. Most of the water available in the Bahamas is reverse osmosis water, and they (have to) charge for water (as high as $.50 a gallon), so we knew we would have to be especially diligent about our water usage or this expense could get out of control. Because we were able to monitor it (it was counted every time we filled our tank), for the first time I could tell how much water we used. On average, we used just 13.5 gallons per day ... total. That's primarily for washing dishes and showers and the like. We carried 260 gallons of water (a lot for boat standards) and so we could go some time without getting water. And there were places we were able to get water for free, too. It sounds extreme, but we really managed quite well. And there's nothing like a Bahamas Bath! The food issue and the water issue (and let's not even get into the laundry issue!) may make this life sound burdensome to some, but really it just became another aspect of the journey ... the adventure if you will. And, after all, this was as much our job as it was our vacation, and we always tried to keep that in focus. Anyway we returned to Miami Beach in March, spent some time there and back at Boca Chita with our friends, Jim and Laurie on Kismet (http://www.svKismet.blogspot.com/) before we headed south and they headed north. We headed to the west coast of Florida and docked Charmed in a slip at beautiful Twin Dolphin Marina in Bradenton and got her ready for sale as we planned for a return to life on land. We always knew this time would come, but it certainly is not without some regret. Craig and I feel we saw and accomplished just about all we wanted, probably me a bit more than Craig, although it still feels like it was just yesterday when we left. And Craig has a wonderful last hurrah. He is joining John on Jay Sea Dee to help take Jay Sea Dee across the Atlantic (with two other guys) to Portugal. Once there, Jodi will join John with the plan that they will sail the Mediterranean for a few years (and I see a vacation in the Med in our future!). The plan now is for Jay Sea Dee to depart Florida May 20 and head for Portugal, stopping first in Bermuda and then the Azores. John has created a special blog just for this trip, and they plan to update it while they are under way. You can follow this adventure at JAY SEE DEE TRANSATLANTIC 2009. You can also track their position at POSITION REPORT FOR JAY SEA DEE. We are thrilled that Craig has this for an end game. He always wanted to take Charmed across the Atlantic (not me) or through the Panama Canal, and the next best thing is to be crew on a great boat like Jay Sea Dee and with a great friend like John. ... and friends again. We have decided to make Florida our home again, but this time we would like to live in Sarasota. Craig may have an opportunity there. I have some exciting ideas for myself, and while Craig is gone, I'll be mulling those over, taking at least one road trip (to North Carolina) and working on our Waves site (http://www.WmWAVES.com/). We are sad to leave behind a life that brought us so many happy times and so many wonderful new friends. We have learned so much, and we know that although life is always changing, it is never boring! While one era may be ending for us, we feel that we are just changing tracks and heading for the next adventure. We think we'll stay in boating, but Charmed is more a cruising boat than a weekender, so we'll be looking for something much different when Charmed has a new owner. In the meantime, we'll certainly take her out and enjoy her as much as we can while she's still ours. We hope you are all well and that you will share with us what has been happening in your journey. Follow Craig aboard Jay Sea Dee as the crew takes off from Melbourne, Florida, on May 19 and heads for Lisbon, Portugal by way of Bermuda and then the Azores. Crew consists of Captain Owner John, John's father Jack, John's partner Barry, and Craig. 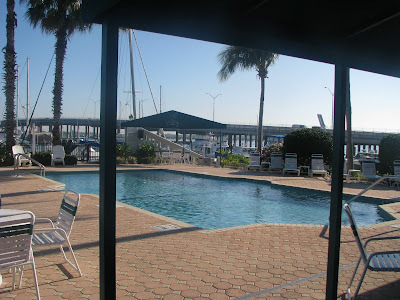 Charmed is settled in her slip at Twin Dolphin Marina in Bradenton, Florida. This is a beautiful and clean marina, with excellent facilities and a welcoming and helpful staff. As Craig already mentioned, we will spend our time between our land home, currently in Volusia County, Florida, and Twin Dolphin, enjoying again the sights of the West Coast and reacquainting with friends we have not spent near enough time with these past few years. 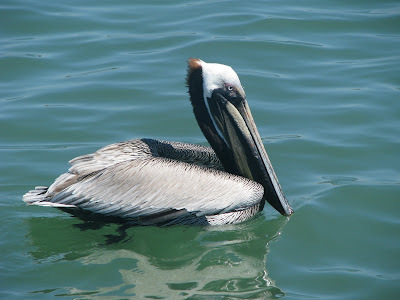 I admit, when we lived in Florida, I never really "saw" the pelican. After living on the water for almost two years, you can't help but notice and appreciate them (and other sea and land creatures). 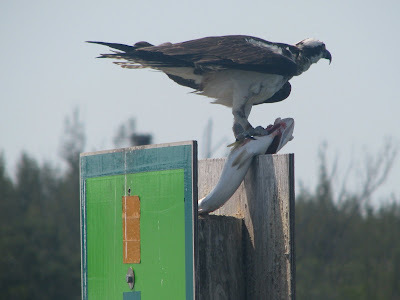 This beauty landed right by our boat this afternoon as we sit anchored off Cayo Costa State Park. NOW HERE'S A BIRD THAT DESERVES A HIGH FIVE! It looks to be a five pound snook. I wonder if he won the fishing tournament. It's all good! However, the end of the hiatus from work is near. enough to last us until real retirement. So Charmed will soon get a slip assignment in the Twin Dolphin Marina. she sells, we will weekend and vacation on the west coast of Florida. makes the best boats. IPers make the best friends! did with the original sender. something really goes bad, like getting salt water in the engine. Charmed will continue to get new oil and new filters every 100 hours. With good treatment and proper maintenance how many hours will she go? On our way to the West Coast of Florida, we stopped to anchor at Little Shark River. We heard the mosquitos and noseeums were bad up the river, so we decided we would anchor outside the river. Before we did, however, we took Charmed up the river for a look-see. We heard a splash in the water and thought we saw an alligator. 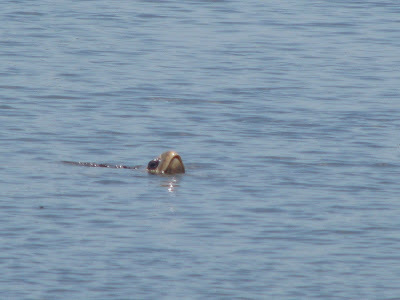 On second look, we saw it was a very large turtle! Before we were back out of the river, we had seen at least five turtles. While it would have been better to see the turtles in the dinghy, I for one was glad we didn't take the dinghy. 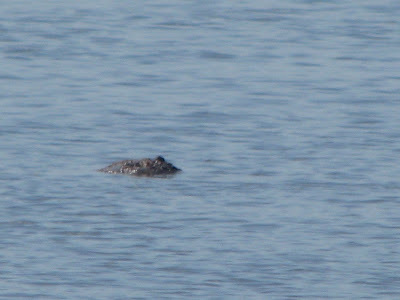 Although we saw no alligators, we knew they are there! Sometimes weather forecasts are favorable. Sometimes they are not. get the two hundred plus miles back to America comfortably and safely. voyage and weather was as expected. Gulf Stream may have been impassable. smooth we kept a close weather eye out for Billy Zane! Here is Obie from Jay Sea Dee, getting a ride from owner Jodi (from Jay Sea Dee). Obie loves to get off the boat, but his little legs wear out. What else is a backpack for?! WE'RE NOT HAVING FUN AT ALL! Here is Morning Wind, Plan Sea, Charmed and Jay Sea Dee in January for an unscheduled Island Packet Minivous at the Exuma Cays Land and Sea Park ... but shorts and jackets?? It was cool and we soooo wanted it to be warm!! careful inspection we started the engine again. The alarm silenced. Oil pressure read low on the gauge. The gauge continued to flicker. Engine temperature and all else were normal. We motored on. The oil pressure sender has one small black wire connected to it. When engine is running there is 12 volts or more at the connection. the gauge to read 80 psig. I have to believe the sender has failed. Jenny (from Lady) and I were on the hunt for sand dollars at Gillam Bay at Green Turtle Cay, Abacos, Bahamas, and look what we found! 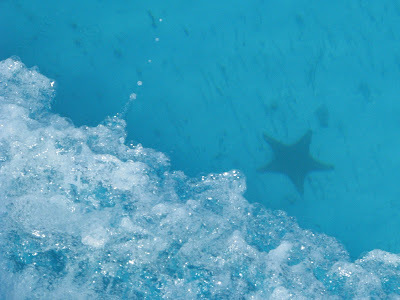 I never saw star fish as large or as beautiful as these until we reached the Bahamas (the first time was in the Jumentos). We also found a different kind of star fish. I told Jenny that we had caught an Asterisk. Jenny is not from Florida, so she didn't understand. In any event, we were also rewarded with lots of sand dollars. The trick is to go at low tide so you can walk far out into the water. Jenny's husband, Charlie, and Craig, were good sports to tag along with us for the entire walk, which took several hours. 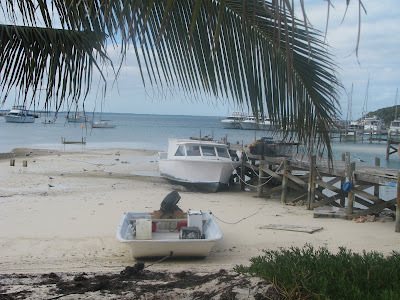 The next day we went over to an island we saw from Gillam Bay (we dubbed it "Gilligan's Island). 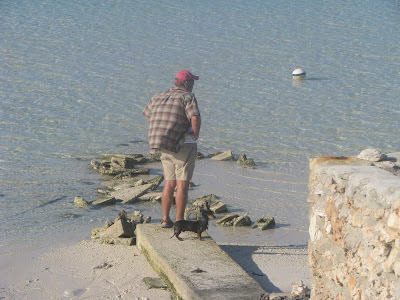 While Charlie and Craig went snorkeling, Jenny and I went on the hunt again, this time finding sea biscuits. This may all sound quite boring and redundant (I was back out to Gillam Bay a day later with Jodi (from Jay Sea Dee) when Jay Sea Dee joined us in the anchorage), and I had just as much fun. I never realized how very relaxing it is to walk along the beach, especially when the tide is low, the water is clear and calm, the sun is shining, and we're with good friends. Could I do it day in and day out? ... I'd be willing to give it a try! THE BAREFOOT MAN HAS ARRIVED. 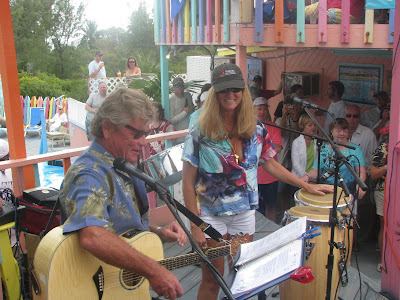 For more pictures of this concert and Great Guana Cay, see the slide show under Photographs. Aside from the fact that we enjoyed a terrific concert, we loved this settlement. Our first night here (and every Wednesday night), Grabbers hosts a pot luck mixer for both cruisers and residents. So we grabbed some chili from the fridge, dinghied over and bought drinks and had a wonderful sampling of food. The residents apparently really look forward to Wednesday nights, and we felt very welcome! The next day we rented a golf cart with Jenny and Charlie from Lady and toured the town. Again, the houses are richly colorful. Most are on, or have a view of the water, and most seem to be rentals. A lot of the "residents" here own houses that they use as their vacation home and rent them out during other times. We have learned much from the look and design of these houses, and we are starting to get the itch to build another house or renovate an older one. Fun! SOMEONE IS READY FOR A PARTY! 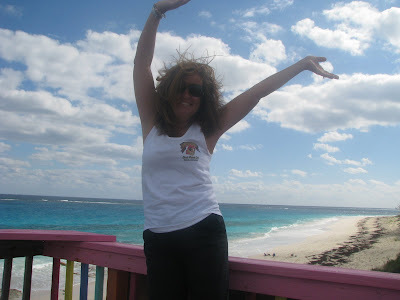 Jodi from Jay Sea Dee is ready for The Barefoot Man concert to begin at Nippers in Great Guana Cay, Abacos. Great Guana Cay, Abacos, Bahamas. 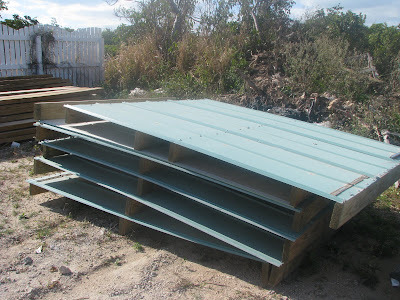 The Bahamian lobstermen use this simple design to "trap" their lobster. Once these are placed, the lobsterman puts a waypoint on the GPS and waits. The lobster find these "shelters" and, considering them safe, hide -- or so they think. The lobsterman returns later, pushes the trap away and starts picking off the catch. We understand this design was invented in Spanish Wells, Eleuthera, and we learned about it from a lobsterman in Spanish Wells. Until then, we wondered how the Bahamians caught lobster, because we never saw any buoys marking traps. The lobstermen use their GPS rather than buoys to find their traps, because if they use buoys, their trap would be obvious to thieves and their catch would be stolen. 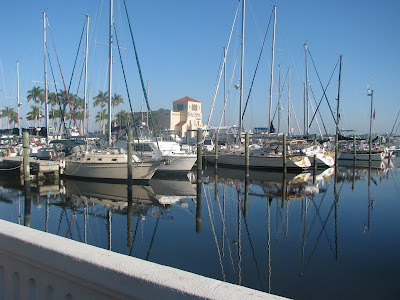 We stopped in Spanish Wells on February 27 and took at slip at Spanish Wells Yacht Haven. We had read in the Charts and in the cruising guides that if you wanted to leave Spanish Wells by way of the north cut (we came in through the south cut), it was wise, even necessary, to hire a pilot because of the unmarked coral heads. When we checked in at the marina, Pilot Ole Pot was in the office and we hired him on the spot. 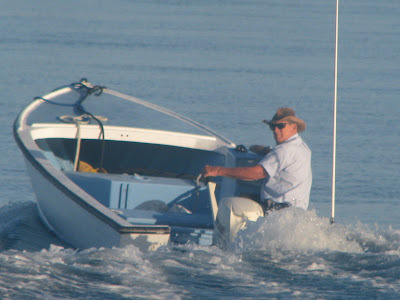 For $35 per boat, he led us and Jay Sea Dee out of Spanish Wells the next morning. 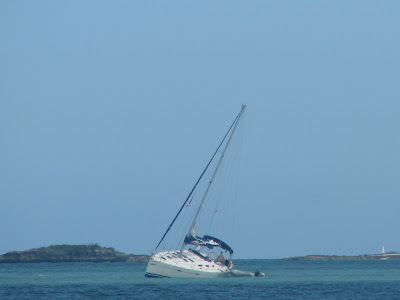 We wanted to take the north cut for a quicker run to the Abacos -- that $35 saved us two hours in rolly seas. SPANISH WELLS ... MORE CIVILIZATION THAN WE'VE SEEN IN WEEKS! It was early afternoon when we arrived at Spanish Wells (northern tip of Eleuthera, Bahamas), and we had little time to waste (stores would close at 5 p.m.), so after docking and checking in at Spanish Wells Yacht Haven, we and John and Jodi from Jay Sea Dee rented a four-person golf cart and off we went. First to the grocery store, which we heard would be more similar to state-side grocery stores than we had seen in the Bahamas so far. We heard right! I've never been so pleased to spend so much money on groceries before! We found a number of items we had not found in quite some time (like a quart of half and half for $4.50 -- we splurged on two quarts!) Then it was back to the boat to unload the groceries and off we went again. We spent the rest of the day touring the area and stopping at shops. We had great fun taking in all the sights and sounds of this community and meeting some of the people who live here. While Spanish Wells is so far the most populated community we have come across in the Bahamas, it is still quaint and also beautiful. Not only the houses but the businesses are decorated and colorful and, as everywhere so far in the Bahamas, the residents couldn't have been friendlier. We ended the day with dinner at The Gap Restaurant. Craig had to try the turtle. He and John say it tasted like chicken -- hmmm. So how does this guy get his boat heeled over so much with no wind and no sails?? Look closely, and you'll see the light water . . . this guy is hard aground! Just minutes before he climbed up the stern and back into the cockpit, we watched him walking all around the boat -- in water that was only waist deep! This is a charter boat, and we're betting that the charter company won't be happy! other a Rage can develop. Waves can be breaking across the whole cut. swells were perpendicular to our path and not breaking. All good. of Abaco, it was like we were sailing in a swimming pool. FEED ME, FEED ME . 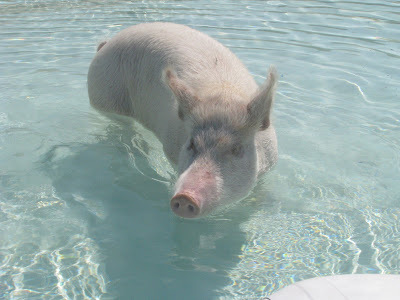 . .
That's what the wild pigs at Big Majors Spot at Sampson Cay (Exuma Cays, Bahamas) seem to be saying as they leave the beach and enter the water while you approach in your dinghy. And often, they do get fed by passing cruisers. We heard the browns ones bite, so we were too chicken to get out of our dinghy. They, on the other hand, have no fear, probably because the locals will hunt only one or two a year. Our insurance allows us to go to the Bahamas between November 1 and June 1, so we went nearly as far south as we could ... to Duncan Town, the only populated town in the Jumentos. We arrived on February 16, dropped anchor and then dinghied two miles to the south to a path by which we could cross to the ocean side. We have learned that if you want to find sea beans, you really should be on a beach on the ocean side, for that is where they are likely to wash ashore. Along with Jodi and John, we were accompanied by new friends, Conrad from It's About Time and Rich from Feral Cat. The trek to the ocean side rewarded us not only with more sea beans, but a lesson about salt ponds, as we had to cross a salt pond on our way to the ocean. From Rich we learned that a salt pond is created when a storm blows the seas inland and water is trapped. The water eventually evaporates, leaving flat areas of salt. The sea salt is then collected and sold. The salt pond we had to cross was mushy and heavy with pellets of salt. It looked like a lake of snow. On our walk the next day into the town of Duncan Town, we saw another salt pond, and it was divided into rectangular plots by stones ... marking ownership. All the natural forces finally came together on February 12 to give us the paradise that we always knew we would find in the Bahamas. At 6:30 a.m., we departed Long Island, Bahamas, with Jay Sea Dee (Jodi and John) and headed for the Jumento Cays. I was a bit apprehensive about going to the Jumentos, as the Jumentos are totally unpopulated except for one small town -- Duncan Town -- at the southern end of the Jumentos. We basically would have to be totally self-sufficient while there -- i.e., we were on our own! What we found was that although almost all of these Cays are unpopulated, and we were told there would be no other boats here, the Jumentos have become more popular, and a few other cruisers are usually close by. We always found fellow cruisers in the same anchorage, some we already knew, and others we quickly became friendly with. This was worth the trip! We arrived at the first cay, Flamingo Cay (i.e., paradise) at 2:30 p.m. I never knew that being in a remote area like this could be so enjoyable. A few boats were already anchored in front of one of the beaches and rather than crowd them, Charmed and Jay Sea Dee anchored off another beach just to the south. The day was sunny and warm, the water -- showing off in different hues of blue -- was crystal clear, and the beaches invited a lazy walk. The landscape of the Jumentos really is not so different from the Exumas, so I wondered what made this visit to Flamingo Cay so different and enjoyable for me. In part, it must be the weather. I am not a fan of the cold, and it was not only no longer cold, but it was also no longer too windy. For a long time I had been looking forward to jumping into the water and swimming and snorkeling, and with this warm weather and this clear, clean water, I could finally do it and really enjoy it. This calm, warm weather also makes longer dinghy explorations possible. It is also nice to be away from the sometimes constant chatter on the VHF radio. The VHF is really a cruiser's only means of communication in the Bahamas, so we generally have the VHF on and scanning the channels from dawn to dusk. In places like George Town and Long Island, it seems cruisers are always talking to each other about one thing or another, and so I welcomed the quiet we found in the Jumentos. In any event, at the beach on Flamingo Cay, we found sea fans, beautiful shells, another sand dollar and even an old float from a fishing net. What treasures! Craig later dove under our boat (sitting in about 8 feet of water), and came back with more sea biscuits for Jodi and I. The boys then went spear fishing and all of us went snorkeling. It's amazing to be able to watch the varied and colorful fish, the living sea fans and other beautiful creatures in their own habitat. Two days later we headed further south to Buna Vista Cay. Again, it was another beautiful day. On the way, John saw a small fishing boat and hailed it on the VHF. Fisherman Allan came back, and John asked him what he was catching. He had crawfish (which we know as lobster, but not like the Maine lobster we are more familiar with) and told John he would also be in Buna Vista Cay that night, so John asked him to stop by Jay Sea Dee. When we arrived at Buna Vista at 11 a.m., it was just us and Jay Sea Dee. Sea Star (Dan and Kathy) arrived shortly after us, and Jodi, Kathy and I went to the beach for a walk. As we walked south on the beach, we saw a small shark swimming north toward us and very close to shore. Kathy raised her camera for a shot, but that shark must have seen us at the same instant, because he turned left and sped away from us faster than I had ever seen anything swim. We also saw several live star fish in the water and within a few feet of shore. They were bright orange in color and probably at least eight inches in diameter. I have never seen star fish so big or so beautiful. Back at the boat later, Craig and I put on our snorkeling masks and swam over to Jay Sea Dee and back. We were in only 8 feet of, again, crystal clear water, so we could see everything. I think there was a star fish every 30 feet -- really a spectacular find. After our swim, we dinghied over to Jay Sea Dee for dinner. For Valentine's Day, the boys cooked us a fabulous dinner and even did the dishes after! While there, fisherman Allan came by with his fishing partner Randy. Allan and Randy had already cleaned their catch and the lobster tails were ready for sale. Charmed and Jay Sea Dee each purchased 8 of these freshly caught lobster tails for $20. We were back to Jay Sea Dee the next night for a lobster dinner!! John did a great job grilling the lobster tails, and even I enjoyed one! From George Town, we participated in a 41-boat sailing regatta to Long Island. Although the winds were somewhat fickle for most of the day, it was a great sailing day and we certainly had fun in our first regatta. We arrived on February 4 and spent the first two days anchored in Thompson Bay, involved in regatta sponsored events. We moved to Salt Pond after several boats returned to George Town. From there, we and friends Jodi and John from Jay Sea Dee and Jenny and Charlie from Lady rented two cars to tour the island. Typically, our mode of transportation is by foot, which, of course, limits our exploration and also can hamper our ability to get any real sense of the community we are visiting. Having a car for the better part of two days gave us a wonderful opportunity to really see this beautiful island. We highly recommend it. Long Island is about 80 miles long with about 4,000 residents. As has so far been our experience in the Bahamas, most everyone we met was friendly and welcoming. Everyone waves, whether on foot or in a car. But this is also an island with its share of struggles. For example, fresh water is not plentiful and so the residents must purchase it at a premium. In fact, everything here is expensive. A typical power bill for a small house for one month can exceed $250, and the price of food is about twice what we pay in the United States. There are no mansions, no Wal-Marts and no fast food. You will find grocery and liquor stores, marine supply and hardware stores, bakeries, restaurants and stores that sell locally made baskets and the like as well as other such treasures, and these businesses are locally owned, much as I imagine they were in the small-town America of yesteryear. In the photos in the slide show you will see some businesses and some homes. Two words about the slide show: There are a lot of photos and many of the photos of the building were taken as we drove by and so some are a bit off. It is a colorful community. On our two-day car trip we visited the Columbus monument at the northern end of the island, the Blue Hole (although we did not stop to snorkel or dive), the Long Island Library, Museum and Community Centre, churches and lots of stores, many of these depicted in the slide show. We dined at Long Island Breeze, Club Thompson Bay, Parrots of the Caribbean, Coco's and Ounce's Hot Spot. We recommend them all. At Long Island Breeze, a new and more modern establishment, you can bring your computer and access the internet and do laundry while you dine at the restaurant or lounge around the bayside pool. Mike at Long Island Breeze does the cruisers a great favor by conducting the cruisers' net every morning at 8:00 on VHF channel 18, providing an update on national news and weather and information about local businesses, and giving cruisers an opportunity to ask about the island (like how we get our propane tanks filled). When you dine at the other restaurants, which seem more "local", it is like eating at home, where the food is always good and you always feel comfortable. All-in-all, we are happy to have met some of the fine people of Long Island, and we thank them all for their hospitality. THERE IS A LOT OF TRASH IN OUR OCEANS! On a visit to Thompson Bay in Long Island, Bahamas, for $5.00, Tryphena, proprietor of Club Thompson Bay, will take you to a "secret beach" to look for shells and sea beans. Eighteen of us piled into Tryphena's pick-up truck, an adventure in itself. I had heard much about finding sea beans in the Bahamas and had not yet had the opportunity to go sea bean hunting, so I was excited about the outing. The ride was about three miles, half of it down a bumpy dirt road that finally ended high above a beach on the east coast of Long Island. The sight overlooking the beach was breathtaking. The water was multiple shades of blue, it was a windy day, and the waves were breaking over the rocks. Once I saw the beach, however, I was taken aback and disappointed to see the mounds of trash that had come in with the tides. Ultimately, I was not surprised that I did not find one special shell nor one sea bean, as my heart was simply not into looking through the trash-laden beach. Several others did find some hamburger and heart sea beans as well as some beautiful and unusual shells. I know many cruisers take time to clean the beaches, but we had not come prepared to do that. Even if we had, I think we would have found ourselves overwhelmed. What a shame to find that our beaches are subject to ruin by our uncontrolled trash. And what a contrast to the experience I had walking along pristine Sand Dollar Beach! 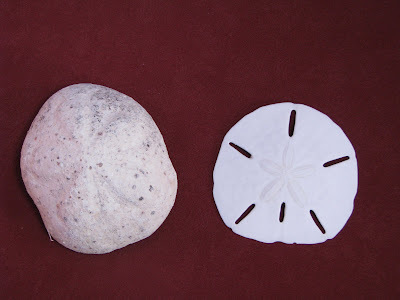 What else would you expect to find on Sand Dollar Beach in George Town, Exumas, but sand dollars! This is one I found on a beautiful walk along the beach with my friends Jenny from Lady and Jodi from Jay Sea Dee. I also found this sea biscuit! The tide was low so we were able to wade far out into the water to look for sea life. We saw several live sand dollars and live star fish as well. The water was clear and the sand was fine and soft. All-in-all, this is a lovely and peaceful beach to spend an afternoon! We have found that having multiple slide shows slows the opening of our site. So we are trying something new with our photos. We have added a section called "PHOTOGRAPHS" that will provide a link to our slide shows. Our old slide shows will remain on the site in their current presentation, but new slide shows will appear under PHOTOGRAPHS. WATER WATER EVERYWHERE . . .
. . . but not a drop to drink. probably should have just for the good of it. Now we are conserving. We live by the weather. George Town Monday we would be stopped wherever we were for many days. miles to George Town must be done in the Sound. shallow. We made Cave Cay. George Town and imagine we will be in the know soon! blogging . . . .
snorkeling marathon at Cambridge, guided by John of Jay Sea Dee. beach of Cambridge Cay. Then the Sea Aquarium north of Cambridge. stretch of about 300 yards. during Happy Hour, and a pool table whose coin mechanism is broken. Kathy of Morning Wind played pool for the first time in her life. short. The run to Georgetown will be a long half day in Exuma Sound. have bright and clear skies and lighter winds. fair if we have to suffer unseasonable temperatures. THERE IS THIS UNNAMED ISLET . . . .
fish on this snorkel tour were the lionfishes. The good news, two solutions to our furling line issue are in play. likely meet up with this cruiser in the next ten days to two weeks. Another fellow cruiser lies Nassau and purchased line for us there. have a new furling line, and then a spare before long. the Sound or Bank side of the Exumas as we wish. over the next several days if we sit tight. morning did we know friends Carey and Hayden were wondering about us. VHF. It still took several days to get a message to us to call home. once we get to Georgetown. In any event, all is well, very, very well! and swimming in the Infinity Pool by 1100. We arrived in No Name Harbor yesterday after our friends, Eva and Ed from Makai, assured us there was plenty of room. Indeed, we are all quite comfortable here. Lady (Jenny and Charlie) is here as well and we are all leaving tomorrow for the Bahamas! Craig and I are ready!! It's a gorgeous day today and the weather window looks near perfect. We plan to check in at Chub Cay and meander down the Exumas to Georgetown, stopping as we please for as long as please along the way. We'll skip Nassau on the way south and consider stopping when we come back north. Also joining us on the trek over are new friends we just met here, Phil and Sarah on Spartina. It is going to be fun (and comforting!) to travel with others, especially since this is our first time over. Today we are doing last-minute (very, very minor) chores, visiting, walking and enjoying the park. We do not think we will have any cell communication while in the Bahamas. While our service provider, Verizon, promises we will (for a steep price, of course), we have heard from others that we will not have service. If that proves true, we'll turn our service off for a few months. In any event, we expect that our only communication will be via email and Skype. What an adventure!! 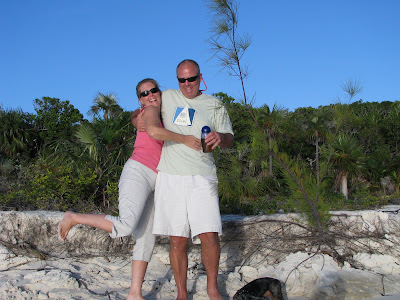 Karen and Gary were able to join us for the offshore run from North Lake Worth to Miami Beach on January 4. They drove two cars from Stuart to Lake Worth, leaving one at the train station and one the Publix and came aboard at 6:30 a.m. We were anchor up at 6:45 a.m. It was a "Don't NOAA" day, with seas higher than predicted (but winds only slightly higher than predicted), so it was a bit rolly to start. As the day progressed, the seas calmed and overall it was a beautiful, sunny and fun day. We loved having Karen and Gary with us. I think we talked non-stop! We only had two exciting moments. First, four hours before we reached Miami Beach, the autopilot failed, so we had to hand steer. Craig took the helm first, but then Karen and Gary wanted to sail as well. You see them here confidently at the helm of Charmed. They were great, sailing like experts! Our next exciting event was going into the inlet at Miami Beach ... with four cruise ships coming out! Those ships are HUGE and sure make the inlet look SMALL. Craig did great, even bucking 2 knots of current. We were anchor down by 5:30 p.m., and Craig dinghied Karen and Gary to shore to meet with other friends for dinner and then catch the train back to Lake Worth to retrieve their cars and head for home. It was a lot of work for them, and we appreciated the effort so they could join us. On Saturday, January 3, as we motored down the ICW from Vero Beach to Lake Worth, our friend Jim (Wind Runner) gave us a flyover in his yellow Cessna 180 on his way to West Palm Beach. He said he looked at hundreds of boats before he found us! We loved it! 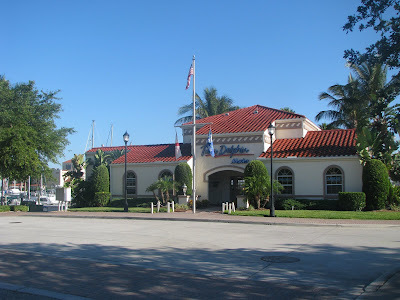 Later, we anchored in North Lake Worth and Jim drove his rental car up to meet us and have dinner. All in all, it was wonderful day, with sunny skies and a visit from a good friend! better than Verizon broadband over the Motorola Q phones on board. PROVISIONED TO THE HILT ... BUT THE WATER LINE STAYS THE SAME! What Craig forgot to mention was the water line! Yesterday we took (for the umpteenth time) provisions to Charmed, and after we unloaded and I was leaving the boat, I made a point to check the water line. I was sure I would notice a difference. Surely the 14 new bottles of liquor, four cases of beer, and 48 bottles of wine would weight us down. Nope! I didn't notice a difference at all. In any event, as Craig wrote, tomorrow we leave our land-based home and happily return to Charmed in Daytona Beach. We have been at our home in Florida for about six weeks while Charmed waited patiently for us to return and take her to the Bahamas. We looked forward to spending the holidays with family and friends, had a great time, and now we are happy to be returning to our water-based home. 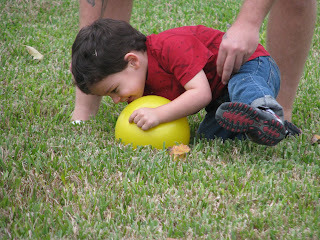 While in Florida, we spent a lot of our time visiting family and friends and preparing for and enjoying the holidays. As Craig hinted, we spent the rest of our time provisioning and provisioning and provisioning some more for the next 4 or 5 months in the Bahamas. While I started the shopping early, I never realized how much work it would be. I am sure glad I at least made my provisioning list before we reached Florida! We made several trips to Charmed with our loads and loads of provisions and then spent hours finding a place for everything and then organizing and making a list of where it all (or most of it) was. Nonetheless, I have great confidence we will forget the whereabouts of many things! We depart Thursday, moving south to a jumping off point to the Bahamas. We know of many others going to the Bahamas, but we hope to make the crossing with our friends Jenny and Charlie on Lady. They are already in Hollywood and promise to wait if we're not too long, so we're hoping for continued good weather the next few days. With Charmed 99.44% provisioned for the voyage to the Bahamas, we will soon be moving again. We will depart Daytona Beach Thursday, looking to make south Florida and possible jumping off points as soon as convenient. Debbie has done a fabulous job of provisioning. My contribution has been mostly as pack mule. There is no question we must think there are no sources in the Bahamas for food or drink, or the other goods we might consume in the next five months. If we put ten pounds of stuff on the boat, we put a thousand. We did read a lot about how to make this trip, and collected comment from those who have gone before us. When shopping we just always put one more, or two more, of whatever we were buying in our cart, especially if the item wasn't a perishable. We should have taken pictures. Thank God for the storage space on Island Packets! Santa brought us a Grundig G5 Radio! It looks well built. We'll have to see if it works well getting far off stations. Right now I have it scanning SSB frequencies. It finds one that a spanish speaking operator is using, but nothing else. The labeling is poor. The manual is horrible. There is not one picture in it. It will take some study and practice to get the most out of the radio. The radio has an antenna connection, ANT. Maybe a reasonably priced external antenna can be located. It would likely improve performance. While here in St Augustine with the new engine out of the break in period, we have had the chance to check the max speed of an AB 10VL with a Yamaha 15 HP two cycle engine, 22 knots. We are thrilled with the performance of this combination. The dinghy jumps on plane with one or two, easily planes with three, and may plane with four in smooth water. We have not had the opportunity to check performance with four aboard. We think we use much less fuel with the new combination than when we had the Johnson 8 HP two cycle engine on the dinghy. The Yamaha is probably newer technology, and it is overall probably working at a better spot on its performance curve. Look for two new mooring fields in St. Augustine next summer, one north of the Bridge of Lyons and one south, to be installed by the City. We heard this today from Dockmaster Sam. The City is waiting on final permits, but we can't imagine why those won't come through. Prices have not yet been set, but Dockmaster Sam says they will be in line with mooring prices charged by other Florida cities. While in Oriental, as we lamented over weather forecasts, Tom (Whispering Sea) shared a quip I like ... NOAA or Don't NOAA. It often seems that NOAA doesn't get it right with either the wind direction, wind speed or wave height. Well, yesterday was no exception, so I dubbed it a "Don't NOAA" day. We dropped off the mooring in Fernandina Beach (just $15 a night) at 6:30 a.m. and headed out the St. Mary's inlet. That was a great run. We had the current with us and so went about 8.5 knots out the inlet. When we turned south, we set sails and thought we would be able to sail all day. NOAA had predicted 10-15 knots of wind. Alas, the sails came in about an hour later as the wind settled down to less than 10 knots and sometimes less than 5 knots. But all was not lost! We had a wonderful day anyway. 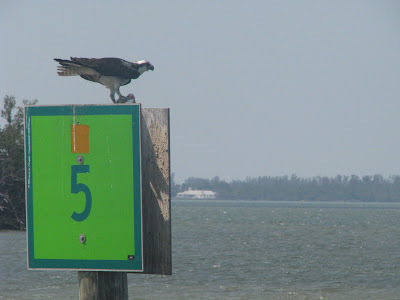 Although we had to motor sail, the conditions were calm, the sun was bright, and we had lots of company on the water. Our friend Carey (Catspaw), who had been with us for several days but left us in Fernandina Beach, had taught us Cribbage, so Craig and I enjoyed a few games in the cockpit as we headed south. We arrived at the St. Augustine inlet about 2:45 p.m., in time to make the 3:00 p.m. opening of the Bridge of Lyons Bridge. We anchored just south of the Municipal Marina. I am happy to be back in the Sunshine State! It has been a long while since we posted. We have nothing to do, and we are three days late! Today we landed in St Augustine. You can see the stops we made getting here on the map above. If you are interested, view the larger map. Then pan around. The list of place markers down the left side are stops in chronological order. If you click on a stop the map will center on that stop. We have had wonderful weather this trip south. Little cold and little rain. Three legs were offshore. Beaufort NC to Jehossee Island, Walburg Creek to Fernandina Beach, and Fernandina Beach to St Augustine. We had hoped to do more offshore sailing, but we would have had to wait for weather. Even though better time is made offshore, and it is usually easier sailing, waiting for weather would have been a delay overall. Highlights of this trip south have included more time with old friends, meeting Jim and Laurie of Kismet, getting hooked on LOST, spending significant time with Tom and Joyce of Whispering Sea(including the making of deer stew), and having Carey bring cribbage aboard. Charmed and Snark spent two nights in Mill Creek in worrisome weather, weather that has you up on a regular schedule to check anchoring gear, boat location, and neighbor location. Gales were predicted but measured maximum wind speed was just over 30 knots. While barely comfortable for brief periods each tide cycle when current and wind caused the boat to sit parallel to the waves, the anchorage was comfortable enough. After Mill Creek we voyaged three whole miles to the Hampton Town Pier. Buffet breakfast at the hotel. Laundry within walking distance at Hampton University. Boat chores. Dinner with Blew Yonder Tom and Tammi. A stop at Wal Mart. After a cold night, a few more boat chores while Charmed prepares for a short ride to Portsmouth, hopefully for a spot in the South Ferry Basin. Snark is already off to Atlantic Marine in Chesapeake City for some alternator and engine analysis. Charmed and Snark lie at anchor in Mill Creek. For a month or more, the weather has been wonderful. Yesterday it turned wet. Last night it also turned cool. Today it will remain wet and cold. Tomorrow it is supposed to clear. There is almost no sense in going into the Hampton Public Piers today as planned. No sense wasting the free night that we got at the Annapolis boat show to just sit there on the boat all day. So we have books, movies, TV, and the first season of Lost that Kismet loaned us. Inflatables may periodically need a little air. They may periodically need air released from them. It is good to read the manual about how to inflate and deflate your brand dinghy, before you need to do it. When we bought our AB a year ago, it was delivered tight as a drum. I was assured it was properly inflated, using a gauge. It was hot outside. Only yesterday did we ever have to adjust the air in the dinghy. Some had to be added. The dinghy had become too limp due to cold fall nights and cool days, and maybe a little leakage. But then it got warm again, and some air needed to be released. I should have done this at the mother ship, or at a beach or a dock. With four persons onboard on the way to the St Michaels dinghy dock, I pushed the red button behind one of the three valve covers. Whoosh! Much of the air came out of the tube I was sitting on, instantly. Worse, I learned the red button is detented! You have to press it once to open it, again to close it. By the time I figured that out almost all of the air was out of the one tube. It is good to know that two tubes of the AB dinghy will easily support an idiot and three other people, a fifty pound motor, and twenty pounds of fuel! On October 5, 2008, Debbie and two friends, Radeen (Island Spirit) and Vanessa (Wind Runner), launched a new website for women sailors . . . www.WmWAVES.com. The site was inspired by a desire to bring women sailors together to share everything of interest to us . . . from boat recipes to how we can become comfortable handling a man-overboard situation and more. It is for women sailors (defined as "travelers by water") everywhere. Please visit the site and learn how this project got under way, what we hope to achieve and what it can do for you. Registration is free and we hope you will share your articles, calendar events, et cetera. If you like what we're doing, please pass the word around to your fellow women sailors. Let's join together and become one unified and strong group of Women Making WAVES! Upon starting the auxiliary engine we check for water in the exhaust 100% of the time. Upon starting the generator engine we used to check for water in the exhaust 90% of the time, sometimes being lazy. We should have checked today. The generator ran twenty minutes this morning before shutting down. The ALARM light was on at the control panel. The TEMPERATURE ALARM light was on at the generator. The inlet strainer for the generator was clean, but no water flowed from it when the lid was unscrewed. The hose was removed from the seacock. Water flowed into the boat. The hose between the seacock and the strainer was the issue. Unfortunately that hose is twelve feet long. A big blow blew dark goo and mud from the hose. Now water flowed easily and fully to the strainer. The generator was restarted, but no water joined the exhaust. The good news is the impeller is very easy to get to, and a spare was back on board. A first spare had been loaned to sistership At Last, who recently had a similar impeller failure. The replacement spare had just been received days ago. The original impeller had completely disintegrated. There were no vanes left on the hub. There were a couple full vanes in the housing along with numerous pieces. We hopefully collected enough rubber to be the whole impeller. We will watch closely to determine whether the cooling system remains compromised with pieces that made it out of the pump toward or to the heat exchanger. Right now there is substantial water flow in the exhaust, and the generator is running at normal operating temperature. We learned a few things today. Check for cooling water flow for every marine engine, every time the engine is started: auxiliary, generator, dinghy outboard. Don't bother hoping an impeller will survive running dry for twenty minutes. The original impeller on the generator ran 240 hours. Yanmar says inspect at 300 hours, replace at 600 hours. With the long hose run from the seacock to the strainer, and then another fair length to the water pump, this impeller may need attention more often to keep its performance high and like new. The instant failure might have been avoided if the contaminant that collected in the hose had made it to the strainer and not restricted flow. It doesn't seem right, putting water into the air intake of a diesel engine, but Yanmar wants you to periodically wash your turbo. RUN A WARM ENGINE IN NEUTRAL AT 3000 RPM. PUT 50 CC OF LIQUID DETERGENT IN THE AIR INTAKE OVER 10 SECS. WITH ENGINE RUNNING WAIT 3 MINUTES. REPEAT THE PROCESS WITH 50 CC OF FRESH WATER. Does anyone have any direct experience completing this service issue? Charmed was launched sixteen months ago with two coats of Pettit Ultima SR Ablative Bottom Paint, a blue signal coat, and a black finish coat. The bottom remained clean in waters, New England to the Chesapeake to the Keys to Maine and back to the Chesapeake. Almost no barnacles. A little slime. However, I wish a second black finish coat had been installed. Even though there was little blue showing, there appeared to be thinning spots, probably as much from installation quality as from wear. The water line wore well, even with a half dozen light brushings over the months to remove weed and other goo. This week three gallons of black Ultima SR went on Charmed's bottom. The three gallons covered one and three quarters coats. Pettit's Quantity Calculator says three gallons should have gone two coats. The paint was clean and easy to apply using a five gallon bucket and a paint screen that hangs over the edge of the bucket. The Ultima is thick and likely goes on thicker than Pettit says is the one coat dry film thickness. Charmed was painted at this point to make sure we keep a good bottom. Now we think we might easily get two plus years before we must haul again to address the condition of the bottom. Charmed's one year old white dinghy looks brand new again! Over the last year, we have kept it as clean as we could, washing it periodically, usually while in the dinghy using rain water, or while in the water next to it using salt water. But today we had the opportunity to put the dinghy on a couple of saw horses three feet high, and we had plenty of water with which to address the dingy dinghy. Mary Kate ON OFF Hull Cleaner is fabulous and the whole answer for the fiberglass hull. It literally is as simple as putting the cleaner on, waiting a minute, and rinsing it off. When dry the fiberglass is ready for wax. Mary Kate Inflatable Cleaner is fabulous, however it is not the whole answer for the hypalon tubes. To get the tubes absolutely clean required using Soft Scrub with Bleach in a second step, after the Mary Kate cleaner stopped doing magic in a few spray on, scrub lightly, rinse off cycles. The Soft Scrub worked best by applying it, scrubbing medium hard with a short bristle brush, waiting a little but not letting it dry, scrubbing medium hard, waiting a little, and so on. It probably took three fresh applications of Soft Scub to get all the brown and green off the tube area at the waterline and below. Now that the dinghy is again clean as it is going to get, we will remain diligent about getting it out of the water most nights. We know it will be impossible to keep the dinghy clean though. There is a lot of scummy water on the eastern coast of the United States. While the two Mary Kate products mentioned above worked well for us, we were completely unsatisfied with ROLL OFF. ROLL OFF is a blue liquid that is not cheap. It didn't do a thing for the dinghy fiberglass or tubes. It also didn't do a thing for the stains on the fiberglass of the mothership. It may work well for other cleaning tasks. For others with a RIB, keep in mind debris works its way into the space between the inside of the hull and lower part of the tube, where the hull attaches to the tubes. It was amazing how much grass, sand and other goo was flushed out of this area, along the whole inside perimeter of the boat. Charmed made New York City about 2:00 pm last Sunday, having departed Port Washington four hours before. It was a wonderful sail through the west end of Long Island Sound, by Rikers Island, through Hell Gate, by the big buildings, past the Statue of Liberty. We planned and rode the maximum ebbing current of the East River for a fun flush between Roosevelt and Manhattan Islands and under the Brooklyn Bridge. Over 11 knots SOG at times. We then had to work against the current up the Hudson, hoping for a mooring at the West 79th Street Boat Basin, before the George Washington Bridge. The moorings are not reserved but handled first come, first served. At only $30.00 a night they are popular. Once within radio range we were given bad news, none were available. We sailed on, looked anyway, happened to find one, and were told we could have it. Once on the mooring we sat amazed at the state of the river and the current. The mooring balls were nearly under water a large part of the time. BOAT SPEED was sometimes over three knots, and we were parked! The waves were two feet. The swells were higher. It was not comfortable, and we wondered how safe we were. The harbor master had assured us . . . . Deciding to sit on the boat until the current was slack the next morning, we enjoyed the scenery from the cockpit until bed time. There was no sleeping on Charmed that night! The boat bounced and bounced. The mooring tackle made loud, horrible noises. We wondered whether the mooring pennants would hold and inspected them for chafe every hour. More often for the periodic louder than loud noises. About 4:00 am we decided we were not going to stay on these moorings. We would not be comfortable leaving the boat for any length of time, at all for that matter. We had not even seen business day river traffic yet! Now we just wanted enough daylight to depart. Once the big boats and fast ferries started passing us just before daylight conditions even got worse. A loud pop turned out to be the parting of one of the strands of one of the two three-strand nylon rope pennants. Now sitting at the helm, watching and waiting for sunrise, I thought it might just be best if we broke off. Then we wouldn't have to deal with casting off. Once Charmed started to swing with the slacking and changing current, and the light started coming up, we did cast off. We found the Liberty Harbor Marina fuel dock up Morris Canal and waited until 8:00 am for them to open. By 9:00 we were docked and napping in a calm cove. Liberty Harbor's tag line is "Are you tired of being bounced around on the Hudson?" We were, in less than half of a full twenty-four hour day. Settled in at LIberty Harbor we now could enjoy New York. Like all tourists we walked and walked and looked and looked. A dinner with Cousin Jim and his friend Jason, and being in the audience of Who Wants to be a Millionaire, arranged by friend Al, were highlights of this trip to The City. This was our second visit to New York by boat. On the first visit we stayed in The North Cove, a marina on the Manhattan side of the Hudson. It is a good place and very convenient to The City. They looked full this time, and we wanted calm as calm could be. The North Cove rocks and rolls throughout the day. It settles down some at night. Liberty Harbor is complete calm, and we needed that after one night exposed on the Hudson. Somewhere along the way, the boom vang on Charmed bwoke. The vang is a Sparcraft rigid vang, operated by gas cylinders used as extension springs. The gas cylinders failed. When, is anybody's guess because a topping lift backs up the vang to make sure the boom stays off the dodger, and the rigid vang worked as a sail control while sailing, even without the extension springs. Charleston Spar was kind enough to say they would fix the vang and return it promptly. They said reworking the vang was not a task easily done on the boat. The issue, how do you get a vang to Charleston, SC, from one city, and get it back in another city? The issue is one of location and timing, possibly complicated by weather. At the time returning the vang was deemed necessary, Charmed was close enough to Hellier Yacht Sales to back track and leave the vang for them to return to Sparcraft. The Shaw's Cove Bridge blocked the last five hundred yards back to Hellier, but good friend Dan happened along in his dinghy while Charmed was floating in the New London harbor. The vang was delivered to Hellier by dinghy, then to Charleston Spar by UPS. Once repaired, we predicted where Charmed would be when the vang was returned by UPS. Good friend Al in Fanwood, NJ, agreed to accept the package and work with us to get it to the boat while here in New York City. The vang was in a box 8 inches by 8 inches by 7 feet, and once received, Al started toward Newark Penn Station on one train. I started toward the station on another. The box was lateraled with just a few stares. The logistics of getting this vang fixed and back on board were interesting. Getting it fixed and returned could have been done more simply. Most marinas will accept packages for transiet boaters, and there are always the stores offering shipping services. Though it is always somewhat of a challenge to limit the handling and expense of getting goods to boat. During the worst of the storm today, I am watching and watching. lying the same way to wind and current. All is well. about ten feet I finally figure out what is wrong with the picture. Charmed and the other bigger boats are anchored in the mud! Charmed's five feet, except at mid tide or above. those days for solo crew on Charmed. just not to be. First, winds were up higher than was being reported. Second, winds were from a worse direction than was being reported. free for the taking. Both suggested not going too deep into the cove. of wisdom, "All the water over six inches under your keel is wasted!" Click the photo to view the slideshow in larger format.